Is getting a puppy at Christmas time really a good idea? Before you bring home a new dog for the holidays, it's important to consider the pros and cons. Should You Get a Puppy at Christmas Time? The scene looks like something out of a Hallmark Hall of Fame presentation. The tree is trimmed, the lights are lit, and the gifts are stacked under the tree and waiting to be opened. Suddenly, a box begins to wiggle and then tumbles over, spilling open to reveal an adorable puppy with a big red bow around her neck. To some people, a puppy might be the best gift they could ever receive, but it's not a gift to be given on a whim. That initial delight could turn out to be a burden if the receiver isn't prepared to handle the needs of a living, breathing pet. 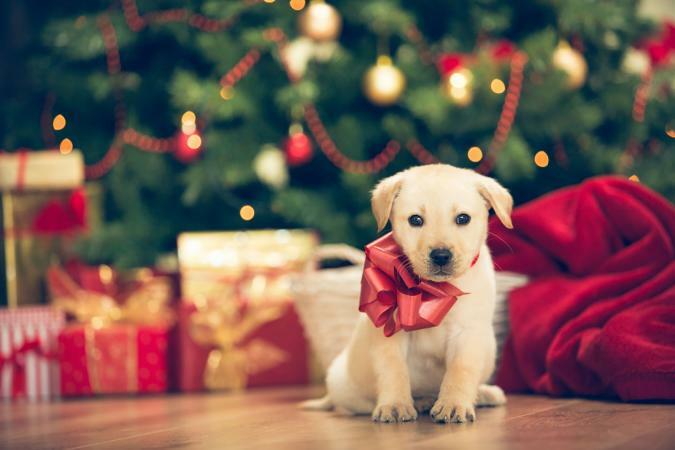 Before you give a puppy to your family or someone else as a gift, ask yourself if this is really the best time to bring a new pet into your home, especially one that requires so much care. The answer to this question depends a lot on each person's situation as well as his/her holiday plans. First of all, a puppy can be the most wonderful gift a person will ever get, as long as you're sure the receiver truly wants one. Today's puppy is tomorrow's lifelong companion. Second, breeders plan for Christmas all year long, timing breeding as closely as possible to coincide with the Christmas season. What this means to anyone who shops for a puppy at this time of year is that it virtually becomes a buyer's market. There will be a bumper crop of pups to choose from so finding the breed you want will be easier than ever. That bumper crop also comes with a limited sales window. As Christmas draws closer, breeders want to assure that every pup they've produced finds a home, so if a breeder has an especially large litter on the ground, you may wind up getting a deal on the price you pay. It's not all candy canes and mistletoe when you bring a puppy home at Christmas time. The extra hustle and bustle around the house may not be conducive to concentrating on puppy training. If your puppy gets off to a bad start with house training, it may take her weeks to get back on track. In the meantime, you will enjoy your new family member significantly less if you are constantly cleaning up her little "gifts." A house full of guests can also be quite nerve wracking for a young pup. Everyone wants to hold her, and the children don't seem to understand that getting passed around for hours may not be enjoyable for the animal. A puppy can easily become tired and overwhelmed, and this can lead to nipping. That bumper crop of pups we mentioned under the pros can also turn into a distinct con. This is because the lure of easy money prompts many people into indiscriminate breeding. They believe all that is required is throwing the male and female together, and they will have an instant jackpot just waiting to be cashed in. What this means to you as a buyer is that you will need to be especially vigilant about checking out any breeder from whom you consider buying a puppy. You need to ask a lot of questions about what kind of testing has been carried out on the parents to determine if they are free from genetic flaws that could be passed on to their litter. You will also need to verify whether the puppies have at least received their first shots before they are allowed to leave the breeder's home. You definitely need to get some kind of written health guarantee that gives you at least a week to take your new pup to your own vet for a complete health check up because getting an appointment between Christmas and the New Year will be a considerable challenge. If after considering the pros and cons you decide to forge ahead and bring a puppy home at Christmas time, here are some suggestions that will make the transition easier. Purchase a crate, dog bed and bowls for the pup, as well as something safe to chew on. Place that crate in a quiet room away from the holiday action. If possible, limit your in-home celebration to your immediate household members. Plan the rest of your activities around the fact that your new puppy will need to be exercised every half hour if you hope to get potty training off to a good start. If you can't be home to take care of this task, perhaps you could ask a friend to stop by your home and exercise your puppy for you. Explain to your children that puppy will need some quiet time and monitor them as they play with the pup. Sometimes children don't understand the signs of a tired and irritated puppy. Avoid sharing any of your Christmas dinner or other goodies with your pup. These foods are sure to upset her tummy. Stick to her regular kibble instead. 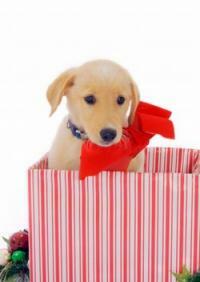 Make sure that all mistletoe and poinsettias are completely out of your puppy's reach. These plants are toxic to adult dogs, and even more so to puppies. Whether you purchase a pup or adopt a rescue dog, bringing a puppy into your home during the holidays is a serious decision. Unless you are sure you can deliver the same amount of attention, care and guidance during this time as you would any other, it may be better to make a deal with the breeder to hold your puppy until after Christmas is over and you're ready to give her the time and attention she deserves. Be sure to visit LTK's Christmas dog slideshow.